July 1 marked the centenary of the beginning of the Somme: one name to cover months of bloody, now-infamous conflict. 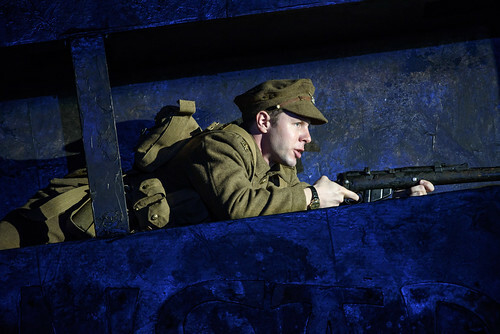 It also saw the last performance of Iain Bell's In Parenthesis at the Royal Opera House. Based on David Jones' WWI poem of the same name, it does a remarkable job of honoring the mythic dimensions of the conflict while refusing to sentimentalize it. Iain Bell's score is atmospheric and richly allusive. In the interval, I overheard it described by a neighbor as "a choral work for soloists," and certainly Bell's writing is unmistakably post-Wagnerian in the way it insists on treating orchestral and vocal writing as part of a unified whole. The opera is also deliberately reminiscent of Benjamin Britten's work, not only in the baritone and soprano "bards" who comment on the action, but also in the gorgeous sea interlude when the protagonist regiment crosses the Channel, and in the vocal writing for Private John Ball, the tenor who is both Everyman and mystic. I thought the opera--and the production--handled the difficulties of a heavily freighted historical subject well. At the opening of the opera, from offstage, a women's chorus chants "Do you remember? Do you remember?" and this collective imperative gives way to the bards' enumeration of men's names, as the characters are introduced to us. 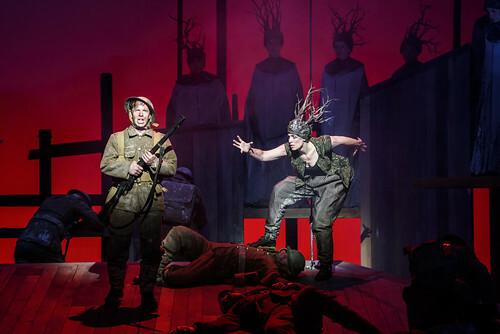 David Pountney's production (created for Welsh National Opera), like Bell's score, departed from the literal as the drama approached the horror of the war most closely. Strings echo the wine of shells, and the percussion section is large and active, but there is also a rejection of realism in moments of stillness and lyricism as deaths are observed by surviving comrades, or by the bards. In their deaths, the lively personalities we have known are transformed into heroes and victims, and it is a loss. The orchestra, conducted by Carlo Rizzi, did a remarkably fine job of conveying both subtle lyricism and sheer overwhelming noise, as called for. Honoring the original poem, which presents war itself as the common foe of all soldiers, the opera personifies Mametz Wood I found this very effective, and the trees of the wood work as twisted operatic sisters of the Valkyries or the Flower Maidens. I was somewhat bothered by the fact that the women of the opera, whether as a chorus of mourners or a row of trees, remain firmly mythical, while the men are individuals. But the opera does do a lot of good work deconstructing heroic masculinity. This made it easier for me to be appropriately moved as Mametz Wood closed in, as inevitably as Macbeth's, the force from which Death comes for the men I'd come, over the course of the opera, to love. One of the things I liked most about In Parenthesis, and which it owes in large part to the libretto by David Antrobus and Emma Jenkins, was its insistence on ambiguity. It holds up--and repeatedly emphasizes--that remembering individual soldiers is considerably more difficult, and considerably more rare, than remembering (and thereby helping to sustain or create) imagined communities. It also makes liberal and fearless use of the epic, sometimes surreal poem that is its source material. The results were impressive; and personally, I think that such rich, serious intertextuality is more likely to age well than libretti that rely more heavily on contemporary diction. I sometimes wondered what audience members who weren't familiar with the poem (or at least with the Bible and the Mabinogion) made of it. Sniggers around me suggested that the Queen of the Woods shrieking Osculetur me... was not appreciated as a quotation from the Song of Songs. The tensions between the worlds of meaning of which the soldiers are aware; those of which we, the audience, are aware; and the apparently meaningless conflict on stage were well-maintained. Private Ball knows that the earth will be changed because he has been reading Rupert Brooke; we know it because of the nearly-annual reports of new relics of the conflict being found: bodies destroyed and decayed and discovered. The singing was uniformly strong, and, importantly for this work, the singers sang excellently as a group, as well as individuals. Like Peter Grimes, the opera is reliant on the men singing as a community, from which individual voices and personalities then emerge. Exceptions to this pattern were Peter Coleman-Wright and Alexandra Deshorties, as the bards. Coleman-Wright started out slightly gravelly, but warmed up nicely, and sang with good phrasing and fine attention to text throughout. Decorates, both in the declamatory role of bard and in the wild vocal ululations of the Queen of the Woods, was very impressive. Her soprano is full and gleaming, with a not-unpleasant metallic edge. She impressed me with the agility of her voice and with her strength across her vocal range. She impressed me with the agility of her voice and with her strength across her vocal range. The soldiers all offered fine characterizations. Marcus Farnsworth, as the amiable Lance Corporal Lewis, was a standout, displaying a sweet, plangent baritone; Lewis and Ball get a lovely duet that offered melodic and dramatic respite. Offering a beautiful, beautifully integrated vocal and dramatic performance was George Humphreys as Lt. Piers Dorian Isambard Jenkins, “whose own the sheep are.” This stripling officer (“so straight, so tall, so beautiful”) is revealed as a man burdened by the consciousness of responsibility, and as a man who thinks in profoundly religious language. “There’s no kind light to lead,” he sings, as he leads his men to the front lines. He dies ignominiously, of course. The main character is a private, John Ball, here sung with remarkable stamina and lyricism by Andrew Bidlack. The role demands that John Ball serve both as Everyman and mystic, a difficult combination, sensitively delineated in musical terms, and remarkably well-handled by Bidlack. He made human anguish and fear, hope and humor all credible, in their full richness and fragility. The opera’s conclusion offers a collective benediction, at last, for the individual soldiers commemorated by the work.